I have a sneaking regard for the Irish media and, in particular, the Irish Times. Collectively and individually, their reporting of Brexit has been so much better than the UK media – even if that is not hard to achieve. 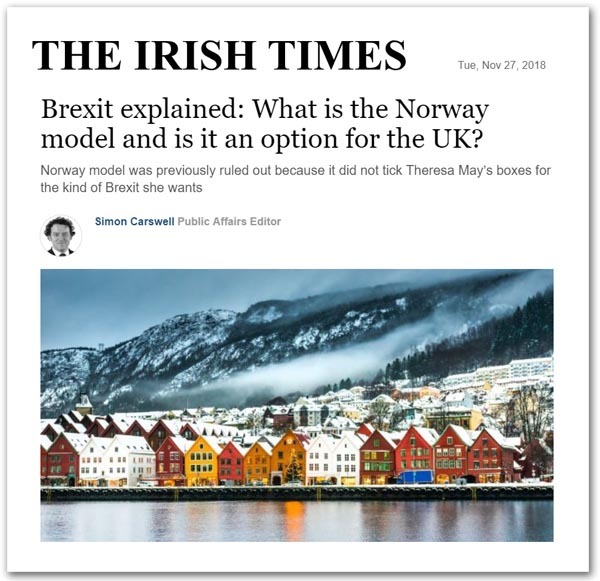 But everything in this game is a spectrum, from the very bad to the excellent, and the Irish Times is no exception, with a particularly facile article on the "Norway model". Author Simon Carswell, the paper's public affairs editor, seems to be living in a time warp – a deadly, information-free zone where basic errors go to die – only to be resuscitated by lazy journalists who need to fill space in a hurry. As to the way he gets his piece wrong, let me count the ways. The "Norway model", Carswell tells us, has been floated as a possible "plan B" for Brexit because of the level of opposition in the UK parliament to the draft agreement signed off by the EU and UK. There, arguably, is his first mistake, embedded in that sentence. Carswell elides Nick Boles's "Plan B" with the Norway option. Boles has actually been promoting his "Norway Plus" idiocy, and any relationship between it and the Norway option is entirely coincidental. But what is really energy-sapping is Carswell's next attempt to inform his readers, as he gaily chirps that "Norway" is helpful "because it is an existing off-the-shelf model and regarded as a type of soft Brexit that could readily be used to avoid a disorderly no-deal scenario". This is a mistake I admit to having made, characterising the option as an " off-the-shelf model". At least with a little bit of study, one is able to correct one's errors – something which Carswell hasn't been able to do – a failing shared by Nick Boles who falls into the same trap. We should not need to say it, because people such as Boles should be able to work it out for themselves. But we have described the EEA Agreement as an "adaptive framework" which is tailored to suit the individual Efta states. Each state has its own version. For the UK, as we have so often remarked, its sophisticated and complex requirements would require considerable adaptation, not least to bring border trade formalities to a close to frictionless as is possible – far beyond that achieved even by Norway. And then, none of the Efta states rely wholly on the EEA Agreement to order their relationships with the EU. Norway has around 50 bilateral treaties with the EU, covering issues such as aviation and VAT. The UK would most certainly have to agree treaties in some of the same areas, but in most cases would have to take the agreements further. Not only is the "option" not "off-the-shelf", therefore, it is not even stand-alone. It would need considerable extra work on augmentation. And all of that militates against it being used as the "quick fix" that Boles advocates. It is difficult to put a time on it, but I can imagine talks lasting 2-3 years or more, before a full working package was agreed. It is a measure of how far behind the curve that Carswell resides, though, that he then goes on to tell us that "Norway makes substantial contributions to the EU budget and has to follow many EU rules and laws, but it has no say in how those rules are formed". Being a "rules taker" – following EU rules without having a say in drafting them – will not appeal to many Brexiteers, the man says. Oh dear, dear, dear. This is the sort of thing trotted out by Theresa May and other Low-Information MPs (#LIMPs) but, even in the nether reaches of journalism, we thought we had got beyond pre-school level. Janet & John is the height of erudition compared with what Mr Carswell is telling us. Predictably, therefore, he falls into every trap going, including an assertion that an advantage of the Efta/EEA option is that the UK could remain outside the EU’s Common Fisheries Policy or Common Agricultural Policy. He is not exactly wrong, of course. The UK could remain outside these policies. However, we have also reached a considerable level of integration in these sectors and a sudden break could be quite damaging. And since the EEA Agreement has provision for policy linkage on both agriculture and fisheries, it would be wise to work up country-specific protocols defining our commercial relationships in these areas. … Norway agrees to the four freedoms - the freedom of movement of goods, services, capital and people so it might cross another UK red line: the British government’s desire to retain control over its own borders and a say in who it lets into the country. While he has been sitting in his Dublin garret, the world has passed Carswell by. Article 112 doesn't exist, Switzerland and Liechtenstein never invoked it and the micro-state never went on to broker a treaty change which allowed it, permanently to modify the freedom of movement rules. Never mind also that Iceland uses Article 112 to temper the effects of free movement of capital. The worst of it is, though, that Carswell is by no means on his own. He joins a long line of issue-illiterates who keep these lame mantras alive. What price an intelligent debate when so many can't (or won't) even get past the basics? However, with the intervention of Boles, we have a new line of disinformation – this predictably aimed at rubbishing the MP's flawed scheme. In this case, it is Bloomberg which wields the knife, damning the thing with faint praise. Giving "that rumpled piece of paper in the wastebasket" a "second look", it opines that "the revised idea has real merit, but it still looks doomed, both by electoral politics and the very sentiment that brought about the Brexit vote itself". With that, we then get told that there would be "opposition to the EFTA Court's jurisdiction and to continued payments into the EU budget for market access". "Most problematic", Bloomberg says, "while the Boles plan envisages an 'emergency brake' on immigration in special circumstances, this is a long way from taking back control over U.K. borders". The author is Therese Raphael, who writes editorials on European politics and economics for Bloomberg Opinion. She used to be editorial page editor of the Wall Street Journal Europe, making her another American writing about European politics, a subject of which she clearly knows very little. But then, Boles has given her such easy openings that she doesn't have to try very hard. Search as hard as you like in the EEA Agreement and you will not find any reference to "emergency brake", or any indication that Article 112 is reserved solely for emergencies. There is even a provision for "exceptional circumstances" which require "immediate action" (Article 113), in addition to the standard procedures. What kind of emergency brake needs an emergency brake? Nevertheless, as she progresses with her own thesis, Raphael betrays her own ignorance as she comments on Boles's new-found advocacy to an "indefinite commitment" to membership of Efta/EEA and then the entry into a separate "customs arrangement" with the EU. Supposedly, she says, borrowing from the Boles crib sheet, this "would obviate the need for the so-called backstop guarantee for the Irish border". Never mind that the EEA Agreement itself embeds a no-tariff arrangement and provisions for customs cooperation. These plus the UK's plan to adopt the EU's WTO tariff schedules, renders any separate customs arrangements unnecessary. Brexit and immigration control have become entwined in the minds of too many voters, for whom every crowded classroom or National Health Service waiting list is a reminder that Britain’s resources are constrained and its public services in high demand. Without economic growth, improved productivity and a sustained public relations effort that changes perceptions the EU, those attitudes will be hard to change. For that reason, Plan B is one many MPs can perhaps love, but they will have a hard time selling to voters as Brexit delivered. Thereby she homes in on the failure of Boles to express in his "Norway Plus" extravaganza what is in fact the great strength of the Efta/EEA option – the ability to modify the rules on freedom of movement, while still enjoying participation in the single market. So we see the immediate future: a near watertight plan, benefiting from hundreds of hours of development work is butchered by a low-information MP, allowing ill-informed journalists to hack it about and expose weaknesses that weren't there in the original. Yet there are those who would have us support this initiative and seek to work with an MP who has already ignored much of our work and continues to do so. While we have been securing the front door, this man has been flinging open the back door to let the naysayers in. To slam that door shut is to demolish the Boles plan, which is the only sensible thing to do. As for the Efta/EEA option, and in particular the iteration set out in Flexcit, in time I am confident that something like it will be adopted – for no other reason than it stands up as an intellectually coherent plan that goes with the tide of events, and is an eminently practical solution to the needs of a post-Brexit UK. What we don't need at this stage are carpetbaggers exploiting a scheme which they barely understand, affording critics yet more opportunities to tear down a fictional version and claim victory on the basis of false claims. There is a good case to make, and Boles isn't making it.